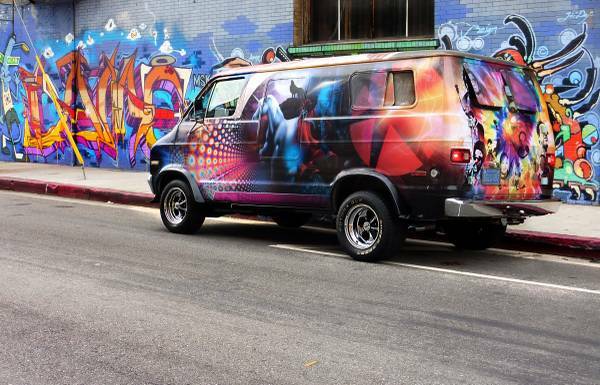 Tipper FuelTruck hit our inbox with a collection of custom vans that was so totally outrageous that I just had to publish the entire batch for your enjoyment. It includes something that was a giveaway called Tilly's neff Van, a 70s Dodge van with carpet padding themed interior, some sweet airbrushed graphics on a 71 Dodge B200 with Cali black plates, a 70 Econoline with Cragar mags and white letter BF Goodrich TAs, but my favorite is the 77 Dodge B200 with a wolf howling at the moon/unicorn/wizard on one side, but a saber tooth tiger mauling a viking in outer space on the flip side...amazing stuff. Big thanks to FuelTruck for all the vantastic links. The real trick with a custom van is that you can't simply stick some aftermarket wheels and call it done, you've got to go full knucklehead. Custom graphics, a huge wing, lifted/lowered, custom interior -- but it doesn't need to be nice/perfect, a bit of grunge is appreciated...just watch 'n' learn. This first van is really the bee's knees -- it is a 1977 Dodge B200 Van offered for $5,000 in Los Angeles, CA via craigslist. What you get is a 5.2 liter V8, functioning AC, fantastic brakes, -- but it is wrapped in custom graphics that include: wizard, wolf howling at moon, unicorn, viking fighting a saber tooth tiger in space, Apollo astronauts, 68 Olympic salute, Bruce Lee. The only thing missing is a nekkid Aztec lady hanging out near a ziggurat. 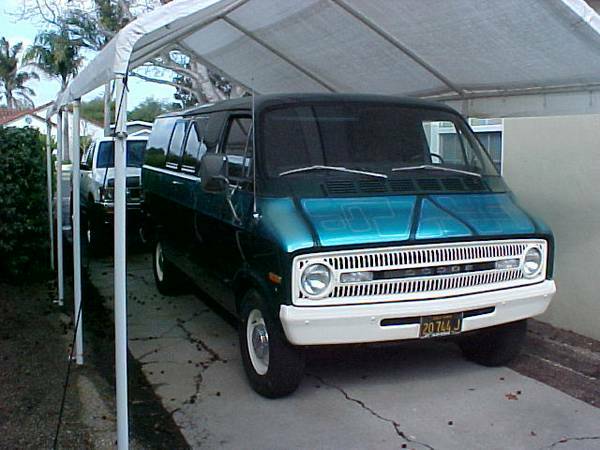 Up next is a 1979 GMC H1500 Savana Cargo offered for $7000 in Las Vegas, NV that is called Tilly's the "neff" van. Unfortunately, none of those words mean anything to me, and I couldn't tell you if Tilly's or neff are corporations, brands, or schedule 1 narcotics. Hey dude, I've got a dime bag of neff, let's mix it with some Tilly's and pretend it's the 4th of July! 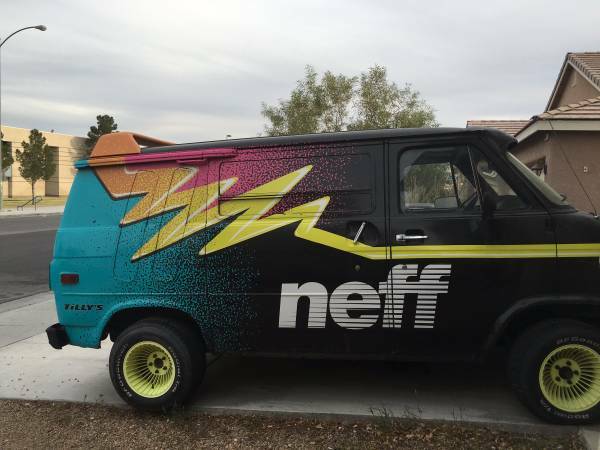 Equally perplexing is Mr T's affiliation with neff or Tilly's -- and it seems that an entity called Cartel Customs built the van and gave it away. Methinks the only way the neff van trades hands again is with a similar arrangement since it currently doesn't run. 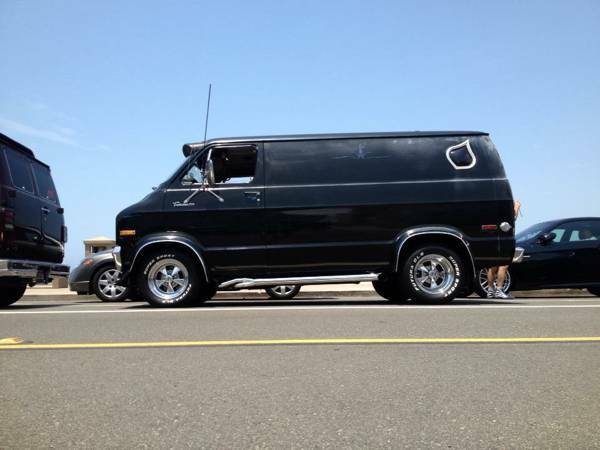 Up next is a 1976 Dodge B200 van offered for $7,500 in Simi Valley, CA via craigslist. This Dodge is offered with original interior and factory paint, but it features a built high performance 340 V8 mated to a 4-speed manual gearbox -- this is a van for the racer. This '71 Dodge B200 offered for $6,000 in Lompoc, CA at first glance appears pedestrian, but it actually covered with a wrap-around air brushed green panel that has geometric lines covering it -- I'm sure there is a name for this kinda thing, but it escapes me [ed CFlo: it's called "panel painting," strangely enough, in the Kustom world]. 318 roller cam engine, 3-speed manual, black plates -- good to go. 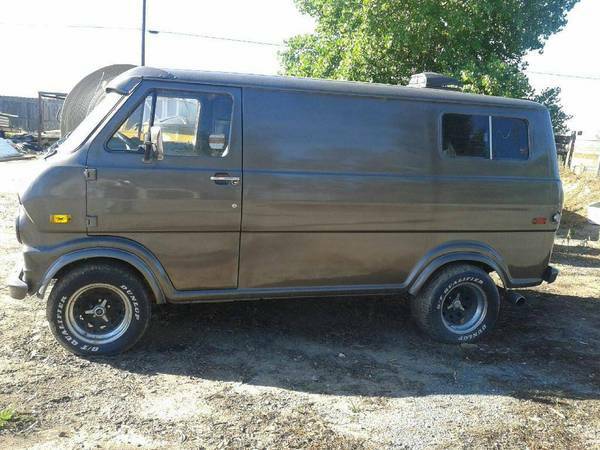 This 1972 Ford Econoline Van is offered for $4,500 in Lodi, CA and features a brand spanking new paint job that just needs some custom graphics to make it POP! It has a manual gear shifter sticking up between the front seats -- almost behind the driver's back; shifting will be interesting. 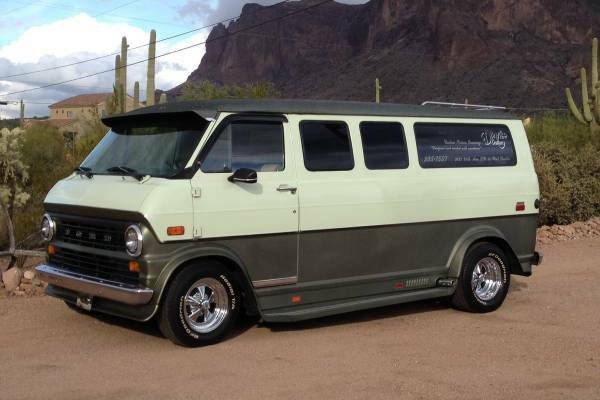 The next van is a 1970 Ford Econoline offered for $11,000 near Phoenix, AZ via craigslist. It features a cool two tone paint job, some aftermarket accouterments / flair and is clearly the more respectable choice if you don't want your neighbors calling the cops on you. 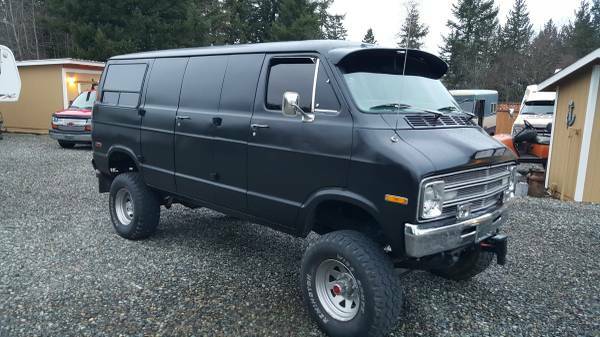 Finally, we've got the obligatory 4X4 van -- a 1977 Dodge 4X4 that runs a 360 V8 to all four wheels via a 4 on the floor manual. Yes, the paint is a boring shade of black...but, check out that hood scoop snorkus up front, and the interior is pretty groovy too.